Facebook Business page admins, take a look at some of the changes you’ll be seeing to your page soon. 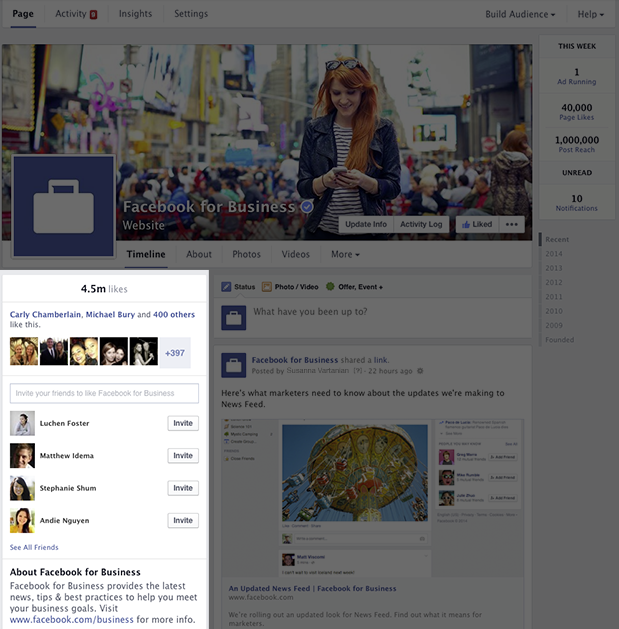 Recently, Facebook released a sneak peek into their new “streamlined look” for Business pages. The change includes a different timeline layout, as well as easy-to-access admin tools. All of your page’s posts will now be featured in one single column on the right-hand side, with business profile information, such as your website URL and hours of business, on the left. As far as admin tools go, you can now access some quick insights from anywhere on your page. Catch up with your page’s recent activity, such as page likes and notifications, by looking at the This Week section. Facebook’s Pages to Watch feature is also being updated, and can now be found in the Insights section. If you’ve been using this tool, you know that it helps you determine how you stack up against your competitors on Facebook. Use this to discover key information about the current pages you’re watching, like engagement levels and page activity. If you want to be the first to check the new layout out for yourself, you may have received an invite from Facebook regarding joining a waitlist. To see Facebook’s update on the new look, view their full announcement here or see some of their FAQs for more information. What do you think of the new changes? Let us know @TECKpert.